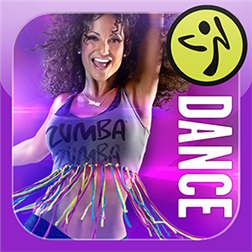 Zumba Dance is now available on the Windows Phone Store! Take your Zumba® Fitness workout wherever you go with the revolutionary new motion-based Zumba® Dance app! Zumba® Dance is the first app with full routines and that can provide feedback and encouragement. Let loose with contagious choreography through Zumba’s signature “exercise in disguise” program on-the-go or at home. Follow along as superstar Zumba instructors, Beto Perez, Gina Grant, and Kass Martin, guide you through each heart-pounding class. Let the music move you with three hours of available routines! Shake it up with chart-topping hits, from LMFAO, Pitbull, Tiesto, Kat Deluna, and Sean Paul, in addition to contagious Zumba original tracks. The unique Zumba® Dance game helps you stay motivated by tracking your calories burned, goals met and technique improvements as you play. The initial purchase includes a 20-minute workout, but you can maximize your workout by purchasing up to 3 pre-programmed 60-minute classes or by creating your own playlist of previously purchased routines with the custom class feature. With three and half total hours of rockin’ routines, Zumba Dance lets you party yourself into shape anytime, anywhere. Written by: Hyde13 on January 2, 2014.